Does my Suzuki need a service? Regular servicing will maintain your car's overall performance and optimise fuel consumption. It will also help to keep it running efficiently throughout its life. We recommend that you service your Suzuki once a year or every 15,000 or 20,000* km, whichever comes first. Check your vehicle’s service booklet for full details. *For correct servicing intervals and pre-2002 registrations, please refer to your owner’s pack or contact your local Suzuki Dealer. They’ve been our lubricant partner for over 30 years and together we’ve won world and national championships with our high-performance motorcycles. 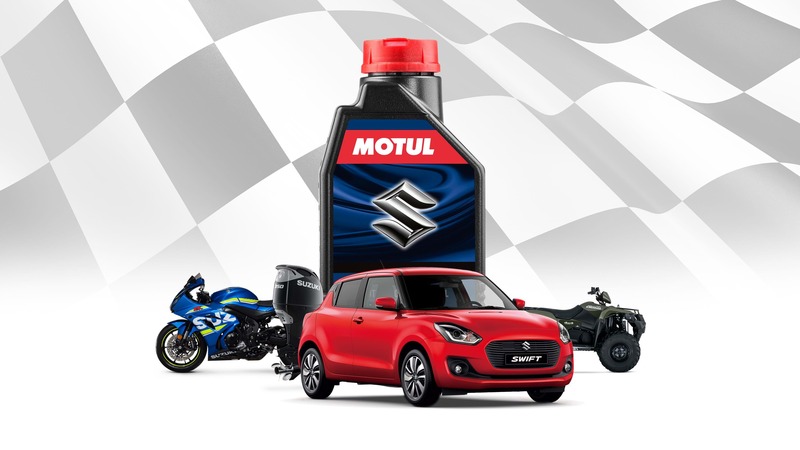 Motul only make oil and they even invented synthetic oil! Suzuki is committed to working within the Code of Practice on safety defects, so sometimes during the life of a vehicle, parts may have to be replaced under a manufacturer's safety recall or service campaign. Both safety recalls and service campaigns are performed free of charge. Recalls address defects that relate to vehicle safety. Under a safety recall, the last known owner to Suzuki is notified and invited to visit their local Dealer. As Suzuki built your car, you can trust us to know all there is to know about servicing and maintaining your vehicle. Our Suzuki trained technicians only use Suzuki Genuine Parts which help maintain the efficiencies of your Suzuki. We pride ourselves on having the very highest standards for quality, and the staff in our Dealer network use this philosophy to build their services completely around your convenience. Find out how your covered from the get- go!